​The RSPO is an organisation (Roundtable on Sustainable Palm Oil). CSPO is the physical oil (Certified Sustainable Palm Oil). Some brands / companies will argue that they source their palm oil from companies which are members of the Roundtable on Sustainable Palm Oil or only use palm oil produced that is sustainable. While Roundtable on Sustainable Palm Oil (RSPO) member companies publicly claim that they are committed to sustainable palm oil, many are not meeting their RSPO commitments. Despite RSPO certification, all of the same destructive practices are occurring and the RSPO is failing to enforce its own minimal principles & criteria. Part of the criteria to become a member of the RSPO is to make a commitment to the RSPO to eventually be 100% certified by 2015 or later. A brand can state they are members of the RSPO without actually sourcing Certified Sustainable Palm Oil, so just because RSPO are mentioned in brand statements it does not necessarily mean they are using certified oil. As of 1st September 2015 Brands / Companies that are not members of the RSPO are not allowed to make any claims to consumers stating that they use RSPO oil, source from RSPO members, use sustainable palm oil or certified palm oil. 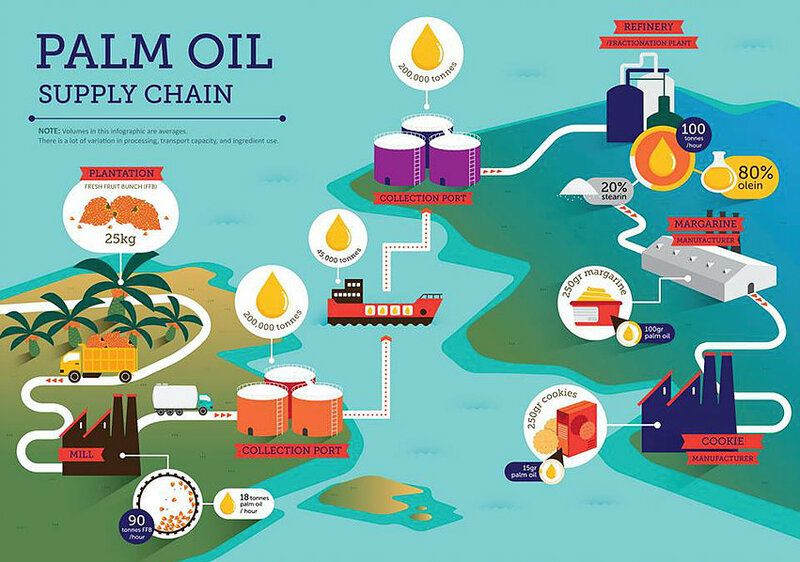 ​GreenPalm aka Book and Claim, was originally set up as a supply chain option to create market demand for RSPO certified sustainable palm oil. GreenPalm is endorsed by the RSPO and WWF and set up by AAK palm oil company. It was put in place to allow manufacturers / Brands time to make the transition to 100% certified sustainable palm oil (CSPO), this was meant to have been until buyers could access a steady and traceable supply of CSPO (Certified Sustainable Palm Oil). 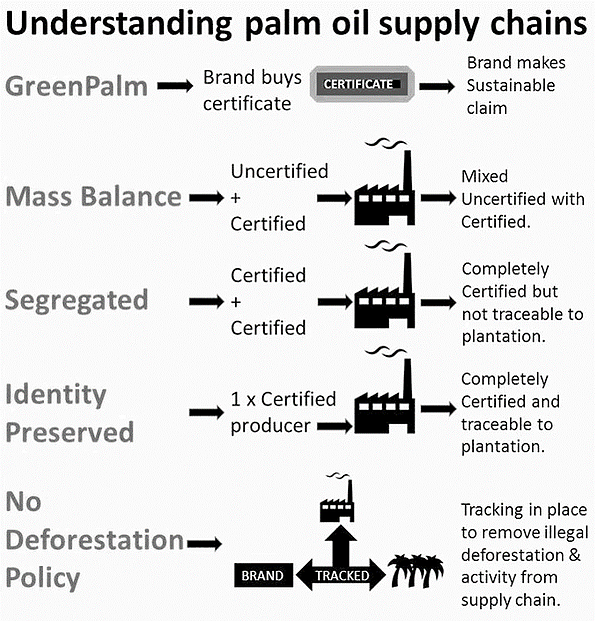 GreenPalm is meant to be used as a temporary supply chain by Brands, however as this system allows brands to make sustainable claims without purchasing certified palm oil, many are using this system as long term supply.is being abused and used as long term supply. GreenPalm is NOT certified sustainable palm oil (CSPO). Certified growers downgrade their oil to uncertified then convert to certificates that are traded on a web based transaction system. 1 x certificate = 1 x ton of oil. GreenPalm is a very cheap option for brands to purchase RSPO endorsed palm oil with a claim stating it supports the production of sustainable palm oil. It is important to note that the physical oil itself is not certified nor sustainable. ​Mass Balance (MB) is a mix of oil using uncertified with certified Palm Oil and not traceable to the source. Brands using Mass Balance can claim that the palm oil used in their products supports the production of certified palm oil. Easiest way to describe Mass Balance is eg: 100 ton of palm from a certified producer is fed into the mill, 100 ton of palm from an uncertified producer is also fed in at the same time, 100 ton of Mass balance is collected at the other end. So what the certified producer feeds in, they collect that same tonnage after processing but it is mixed with uncertified palm. Imagine filling half a glass of water from one tap and topping it up from another tap. There is no way to know which tap the water in the glass has come from, as it is mixed and you cannot separate the liquid. The Segregation supply chain model (SG) assures that RSPO certified oil palm products delivered to the end user comes only from RSPO certified sources. It permits the mixing of RSPO certified palm oil from a variety of certified sources. Segregated is fully certified palm oil however still not traceable to plantation..
​The Identity Preserved (IP) supply chain model assures that the RSPO certified oil palm products delivered to the end user, is uniquely identifiable to a single mill and its supply base and is kept physically isolated from all other oil palm sources throughout the supply chain (including other segregated RSPO-CSPO sources). Fully certified and traceable to the source. A no deforestation policy means that the brand or palm oil company has gone above and beyond certification with extra standards including no peat & no exploitation, Brands with a no deforestation policy work with a 3rd party to engage with their suppliers to track and map their supply chain. No deforestation or Zero deforestation does not mean that there is absolutely zero deforestation in the supply chain, it does however mean that the company have strengthened and built upon the weaker RSPO standards to remove illegal deforestation from their supply chain. Those with a No Deforestation or Zero Deforestation policy also means that they have made a strong commitment to ensure that if illegal activity is found to be leaking into the supply then the company will take action to cut out that supply. The companies with these policies are doing their utmost best to ensure the supply is ethical.